Did you know, Fort Lauderdale is known as the catamaran capital of the world? If you didn’t, you will certainly find out at the upcoming Fort Lauderdale International Boat Show. In fact, the show is taking place just next week! Chris, thanks for your comments. The reliability of the platform is a common question. It is hydraulic. A system that has been used on power boats, farm equipment, and other heavy industrial equipment that undergoes rough usage day in and day out and offers superb reliability under the most adverse conditions. That’s why this system was chosen–for it’s heavy duty, robust capability.. It has been carefully designed so that when up, it is totally clear of the tunnel and it’s resulting stern wave. It goes down to the level of the stair platforms just above the water, providing a lounge terrace as shown in the pictures, and, finally, it lowers beneath the water for launching of the dinghy or scuba divers. Unique on a sailboat at this time, but a sign of things to come. The Annapolis Sailboat Show 2016 crowds are gone, but the boats are still here at Atlantic Cruising Yachts! We invite you to our Annapolis, Maryland location Open House on Saturday, October 22 from 11 AM – 2 PM. Don’t miss this opportunity to get a closer look at some of the Jeanneau and Fountaine Pajot yachts you didn’t get to see at the boat show. Imagine you’re a fly on the wall, hearing experienced catamaran aficionados discussing some of the issues brought up with the new designs displayed at recent shows. What are the differences and how should they impact your choices? The Annapolis Boat Show is in just two days, from Thursday, October 5 until Monday, October 9. Attendees will get the opportunity to climb aboard some of the sea’s most extraordinary boats. 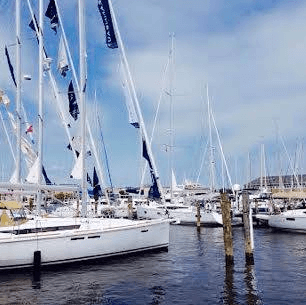 They will be able to tour and learn more about the world’s finest vessels and state-of-the-art equipment while browsing through vendors’ tents and stocking up the latest and greatest sailing gear. Something to keep in mind is that while this show is one not to miss and garners a lot of attention, the crowds often make it difficult to easily navigate through the show and can be overwhelming. The Grand Daddy of all in-water sailboat shows in the world. The first show. The one show not to miss. Click for review of last year. Typically over 300 boats, fully rigged and equipped the way you want to use them–in the water. Small boats, dinghies, life-rafts and the rest on land. Several circus tents of equipment displays, often manned by the owner’s and experts of the companies. Vacation (Charter) basin–all of the major charter companies represented as well as our affiliates and our Annapolis charter company, Cruise Annapolis. Live mini-seminars featuring tax experts and owners–At our ACY/Cruise Annapolis floating tent display in the Vacation basin. Information and lecture series–sign up at boat show site, and/or get tickets in advance! CLICK HERE. VIDEO To give you the flavor, and show you where our home office is, On the Harbor–It all started some 45 years ago in annapolis, because this is arguably, the first and biggest in-water show in the world! Click the photograph for a virtual tour of our office and marina. Walk down the docks, on the boats and into our office. We have virtually all of the Jeanneau and popular Fountaine Pajot models in Annapolis now available to see, charter or for an ASA sailing course. Open house at our office, Sept. 17th, 10:00-2:30. Get a sneak preview. Curious why Annapolis is the number one place to shop for a boat? We’ll tell you why it is, how to get here, and what to see and do. Plus, we’ll provide you with links and resources to make your trip easier. For charters, or ASA courses, visit Cruise Annapolis. Going to an upcoming boat show? 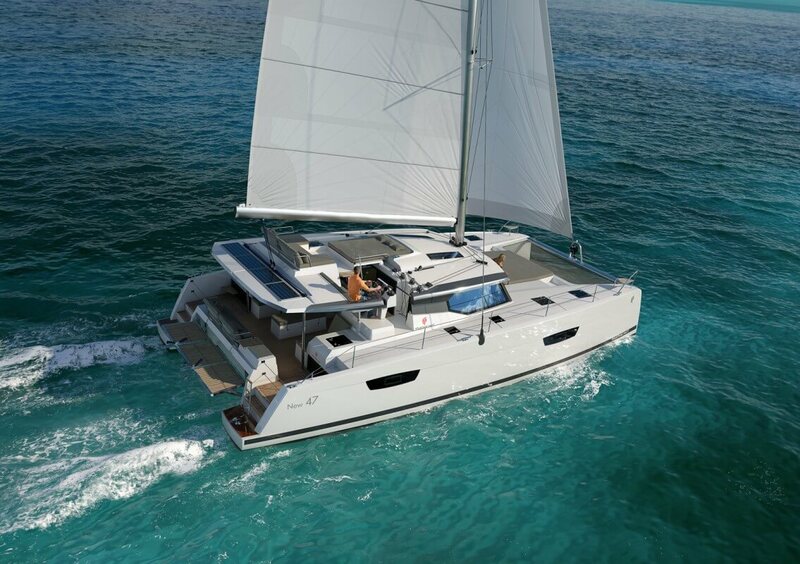 See and learn more about Jeanneau and Fountaine Pajot Sail and Power boat models. Seminars on our Boat Business program. Talk to base managers and owners. Tax seminars with extended Q& A sessions. Yacht consultants can reserve a priority production slot, provide pricing and answer your questions. 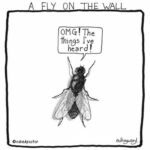 What’s happening, places to stay, things to do. Why consider Catamaran Motor yachts? 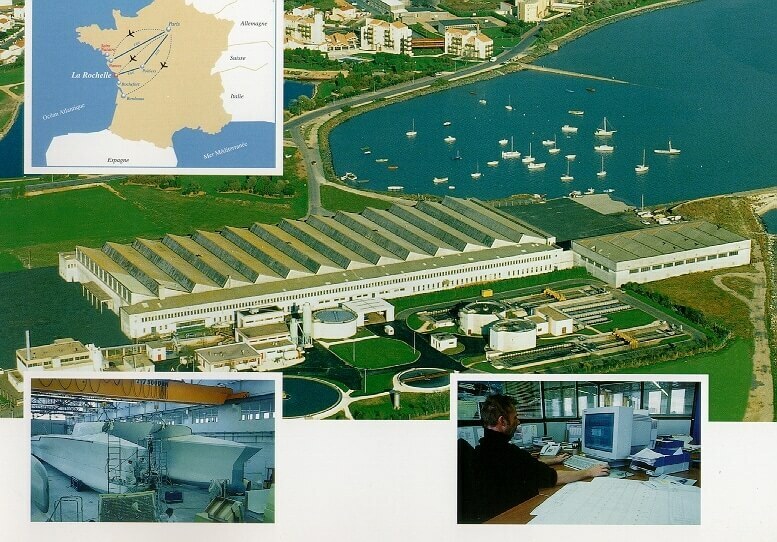 Over 17 years ago, Fountaine Pajot decided to build commercial catamaran ferry boats–in fiberglass. They struck a deal with the city of LaRochelle to lease the old WWII Seaplane factory down on the water. The design team has applied their engineering and design expertise from commercial boats to true catamaran motor yachts. This expertise just isn’t generally available to traditional manufactures of non-commercial yachts. Catamarans cost less than monohulls! Really? Interesting that my customer, “ML” chose these two models, because I’ve done a rough calculation and determined that, in fact, catamarans cost more than monohulls–per foot! No! Not a revelation you say, but I also found that looking at the same data a different way, that the price came out about the same–when you compared usable space. Cost per Cubic Foot, in other words.